Ronald Giovanelli was born in Grafton, New South Wales, on 30 April 1915, the only child of Irwin Wilfred Giovanelli and his wife Gertrude May, nÃ©e Gordon. Ronald’s father was one of the first teachers at Grafton High School. During his career as a mathematics teacher Irwin became well-known and highly respected throughout New South Wales both as teacher and headmaster. Ronald’s great-grandfather, Guiseppe Giovanelli, migrated from Ravenna, Italy in the 1850s, reputedly for political reasons as a supporter of Garibaldi after his unsuccessful defence of the newly-formed Roman Republic against the French and Austrians. Ronald spent his early years attending primary schools in the small country towns of Milton, Trundle and Forbes under the headmastership of his father. It is likely that this association was responsible for his own dedication to the teaching of physics and astronomy, even when this involved the hardship of an excessive work load. Ronald’s secondary education was delayed for two years until he reached the age of twelve, when he left home to board privately in Sydney while attending Fort Street Boys’ High School, one of the leading schools in New South Wales. He excelled academically at Fort Street, was made a prefect and won a Public Exhibition to the University of Sydney. While at school he also studied the piano, the beginning of a lifelong association with the arts. His generation of the family showed considerable talents in both science and music; another grandchild of George Giovanelli was a PhD in plant physiology and two others graduated at the top of the New South Wales State Conservatorium of Music. One later became a leading concert pianist. While still at Fort Street, Ronald proved to be a good sportsman and he later became an excellent tennis player. In 1933, he commenced his science degree at Sydney University, and graduated in 1937 with First Class Honours in physics. He was awarded his MSc in 1939 and his DSc in 1950, both from the University of Sydney. In 1959, Giovanelli accepted the position of Honorary Associate of the Department of Applied Mathematics, University of Sydney, in order to supervise the PhD courses of students studying solar physics. For the academic year 1968, he was Professor of physics at Wollongong University College (until 1974 a college of the University of New South Wales) and a member of the Professorial Board of the University of New South Wales. He worked for the university two days per week lecturing in astronomy and as Chief of Division the remaining time. He was a visiting scientist at the Kitt Peak National Observatory, Arizona for six months in both 1975 and 1979, and then for a whole year in 1981. Other observatories visited include the Fraunhofer Institut (now the Kiepenheuer Institut) in West Germany, where he worked with the Director, KO Kiepenheuer, on the problem of radiative transfer in the chromosphere. Visits to Europe usually included a stop at the Astronomical Observatory, Sonnenborg, Utrecht, The Netherlands, and some work with his friends there: C de Jaeger and the Director MJG Minnaert. In Italy he worked with his long-time friend G Righini, the Director of the Observatorio Astrophysico di Arcetri, near Florence. In 1981, he gave a course of lectures at La Trobe University, Melbourne, on plasma physics and in 1982 was invited to Paris and Boston to give a series of lectures at the Observatoire de Meudon and the Smithsonian Institute respectively. His career research interests were in both optical measurements and solar astronomy. The major portion of Giovanelli’s professional career was as a physicist concerned with optical measurements as outlined above. However, this was not his main research interest, which was solar astronomy. After graduating in science at Sydney University, he found few opportunities offering for a career in physics. He made a most fortunate choice of a Research Fellowship at the Commonwealth Solar Observatory at Mount Stromlo, near Canberra. Here he spent the years 1937-39 gaining experience in optical observations of phenomena in the solar atmosphere. He made many observations and developed an intense interest in this work which remained his main professional concern for the rest of his life. This early work was concerned mainly with solar flares and related phenomena occurring usually in the vicinity of sunspots. The flare phenomenon and other problems in solar physics led Giovanelli to decide that a solar optical observatory should be created within the CSIR, but this project had to be postponed for more than a decade. Accurate standards of physical measurement were urgent requirements for isolated Australia during World War II. CSIR responded in 1940 by recruiting a number of physicists for training at the National Physical Laboratory (NPL) in England. One of these was Giovanelli who was awarded a Science & Industry Scholarship. The objective was the creation of a nucleus of staff to establish an Australian National Standards Laboratory, that later became known as the Division of Applied Physics, National Measurement Laboratory. Giovanelli and two other young trainees joined six other Australians already stationed at NPL under the direction of GH Briggs, Officer-in-Charge of the Physics Section of the NSL. Ronald was also one of six who formed the ‘Australian Section’ of the NPL Home Guard. At NPL he specialised in optics, light and photometry, and was extremely busy working with NPL personnel and at the same time arranging for the purchase and dispatch of equipment for the Australian laboratory. In 1941, he returned to Sydney via the USA and Canada as an officer of the Physics Section of NSL, being responsible for optics and photometry. As with the other NPL trainees, he was initially wholly concerned with setting up the equipment purchased abroad and with the training of staff. A problem which has been encountered by various countries at the onset of war is a shortage of optical glass. Australian approaches to glass manufacturers in the United Kingdom and elsewhere were met with a ‘wall of secrecy’. However, it was found that, following their 1917 problem, the USA had maintained two important centres of research and small-scale production of optical glass. One of these, the National Bureau of Standards in Washington DC, was thrown open to Australian scientists, including GH Briggs and Giovanelli of the Australian NSL. The information made available to this team led to the manufacture of high-grade optical glass in Australia. Some 620 melts were made and all had their refractive indices and homogeneity measured at NSL. Australia’s war-time requirements were met and the foundations were laid for post-war optical industries. Optical glass was even exported during the war to India. In the tropics these spotters often suffered eye damage following the observation of dive-bombing aircraft approaching from the direction of the sun. The solution was tinted lenses with small centrepieces of very dark glass just large enough to cover the sun. This was another successful project, the solution of which, was the use of red light of correct intensity to illuminate instrument panels. At the conclusion of the war, the NSL turned to the task of providing calibration and other measurements of a wide range of physical quantities. Meanwhile, however, the war had left a new set of problems in optics, one being a serious shortage of optical scientific instruments for use in teaching in the rapidly expanding universities. In particular, some 1 300 microscopes were needed, and tests of these were carried out at the NSL by WH Steel under the direction of Giovanelli. The main objectives of the laboratory remained the provision of standards of physical measurement and the development of lines of worthwhile research necessary in such a laboratory to attract and hold high calibre scientific staff. Giovanelli was initially in charge of a group concerned with light and photometry and the establishment of calibration facilities and other properties; he was later head of the section of the Division of Physics in CSIRO concerned with these matters. Throughout his working life, Giovanelli’s main interest was the physics of the solar atmosphere and convection zone. This interest is reflected in his numerous published papers describing both observations and theoretical studies. The latter comprise investigations in three main areas, the first being radiative transfer in stellar atmospheres in the absence of thermodynamic equilibrium. The other two studies centred on magnetic fields and their effects, the first being solar flares and the second, actively pursued during his last few years, the solar magnetic cycle and the origin and morphology of solar magnetic fields. In the early 1950s, the pressure of work connected with standards of measurement fell to a level where Giovanelli was able to return to solar observations. Activities included attempts to establish a world-class solar observatory on Australia’s highest mountain, Mount Kosciusko and, when this was abandoned in 1954, on the roof of the NSL near the centre of Sydney. The observations undertaken comprised a flare patrol, providing continuous monitoring of flares or localised enhanced chromospheric emissions. The ‘flare patrol’ was a worldwide co-operative effort to ensure that optical observations were available for every solar flare. Other measurements, including solar radio emissions, geomagnetic storms, auroras and other geophysical effects could then be related to particular optical flares for a better understanding of the whole complex ‘flare event’. The flare patrol program was later moved to a new observatory site at Fleurs. The first instrument put into operation at Fleurs (by RE Loughhead and VR Burgess) was a conventional photoheliograph, a general-purpose instrument capable of performing a variety of tasks when used with auxiliary equipment. The decision as to which of these various tasks should be undertaken was vital to the future of solar observations in Australia, and it was early in the Fleurs era that Giovanelli made the bold decision to embark on the design and construction of a world-class filter telescope or spectroheliograph. The sun being a highly ionised gas with magnetic fields, the basic physical properties most needed for an understanding of solar phenomena are temperature, pressure (or density), velocity and magnetic field, together with their variations in space and time. Giovanelli’s ambitious decision was to attempt to measure these quantities simultaneously over extended solar regions in short periods of time. To do this required special techniques, in particular the construction of optical filters of extremely high spectral and spatial resolution to provide an image of a large part of the solar disc in the light of a small part of a particular special line. In 1965, the CSIRO solar optical observatory was moved to the permanent site at Culgoora where it continued for many years to provide a huge accumulation of statistical data. This site was chosen to be adjacent to a solar radio observatory and there the optical observations have continued since 1965. Giovanelli had few opportunities to use the various instruments at Culgoora because of his administrative duties in Sydney. He did, however, collaborate with JV Ramsay in measurements of plasma velocities in magnetic regions. He also made a series of observations of motions caused by oscillations and waves in a sunspot magnetic field. When ill health forced his retirement from administrative work in 1974, Giovanelli used the opportunity to make a further series of observations of plasma motions and structures in magnetic and non-magnetic regions. The importance of this work is that almost all phenomena observed in the solar atmosphere are influenced by, if not caused by, magnetic structures. While the significance of magnetic fields had long before been recognised by Hale, Babcock and others, the dominance of magnetic stresses in many phenomena had been largely overlooked. The Culgoora magnetograph and associated theoretical work played an important part in overcoming this omission. Full details of his scientific contributions can be found in the memoir written in 1985 by Jack Piddington, Senior Research Fellow, CSIRO Division of Applied Physics (follow the link in the Source details below). Giovanelli’s contributions to science were recognised in a series of meetings of physicists and astronomers in Australia and the USA. The first of these tributes was paid to his contributions to our knowledge of solar-terrestrial physics. 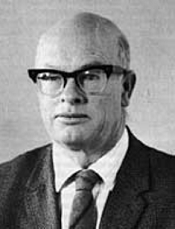 During the sixth National Congress of the Australian Institute of Physics, held in Brisbane in August 1984, a series of Solar-Terrestrial Physics Workshops was dedicated to his memory. The workshops were co-sponsored by the Australian Academy of Science. The second tribute was the RG Giovanelli Commemorative Colloquium held in Sydney during the period 26-29 November 1984. This colloquium was titled ‘Past Progress and Future Developments in Solar and Stellar Atmospheric Physics’, and was coordinated by PR Wilson and WC Livingston. It was attended by 40 Australian and overseas astronomers, including representatives from observatories in the USA, France and West Germany. The official opening and welcome was made by JP Wild who recalled some of the early problems in which he and Giovanelli had been involved at Culgoora while they directed the radio observatory and optical observatory respectively. During that colloquium the participants gathered around a sundial in the grounds of the Division of Applied Physics of CSIRO to participate in a ceremony of presentation and dedication to the memory of RG Giovanelli. As I mentioned at our meeting Ed Hones of Los Alamos showed this video that Ron had prepared perhaps six weeks before his death. In this talk Ron exudes wisdom about sunspots, prominences and magnetic reconnection. He gently abrades others for drifting into mathematics and leaving out physics. He continually reminded us how little we knew about the sun or, to put it differently, how much there was to learn. At the end of the tape there was the strangest quiet in the room – not a stir. Never, ever, have I seen this response from a room full of astronomers! Over a period of some 25 years Giovanelli was involved in the administrative functions of various scientific bodies as summarised below.